Another year, another over-stimulating NAB Show is over. And while we plan to share with you some of the practical advice from all the sessions we held at booth SL2426 (as well as some very cool behind-the-scenes videos), today we just want to share some images and memories. 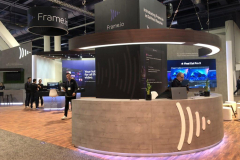 From our “Best in Show” award for Booth Design, to the standing-room-only booth sessions, to all the buzz over our DaVinci Resolve and API/Zapier integrations (thank you RedShark News), NAB 2019 will go down in history as one of our best! Here’s what you may have missed (or the memories you may want to relive).